2 Kings 24:12; 25:27-30 King Jehoiachin of Judah, along with his mother, his servants, his officials, and his eunuchs surrendered to the king of Babylon. The king of Babylon, in the eighth year of his reign, took Jehoiachin prisoner. [597 BC] … 27 In the thirty-seventh year of the exile of King Jehoiachin of Judah, on the twenty-seventh day of the twelfth month [March 22, 561 BC], King Evil-Merodach [Amel-Marduk] of Babylon [son of Nebuchadnezzar, 562-560 BC], in the first year of his reign, pardoned King Jehoiachin of Judah and released him from prison. 28 He spoke kindly to him and gave him a more prestigious position than the other kings who were with him in Babylon. 29 Jehoiachin took off his prison clothes and ate daily in the king’s presence for the rest of his life. 30 He was given daily provisions by the king for the rest of his life until the day he died. During his excavation of Babylon in 1899-1917, Robert Koldeway discovered a royal archive room of King Nebuchadnezzar near the Ishtar Gate. It contained tablets dating to 595-570 BC. The tablets were translated in the 1930s by the German Assyriologist, Ernst Weidner. 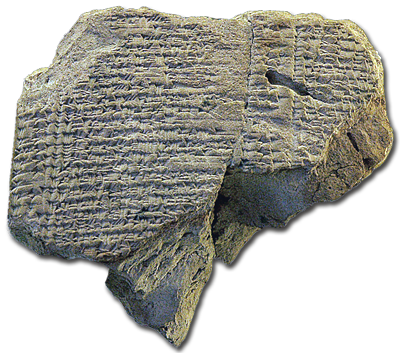 Four of these tablets list rations of oil and barley given to various individuals—including the deposed King Jehoiachin—by Nebuchadnezzar from the royal storehouses, dated five years after Jehoiachin was taken captive. Notice how much more Jehoiachin got than everyone else. Obviously he had the king’s favor. This confirms the existence of Jehoiachin. This confirms the Biblical account of his rations. Perhaps Jehoiachin is referred to as the son of the king because he only reigned for 3 months. These posts about biblical archeology are awesome. I do have one question? What about the finds of the real mt Sinai and the red sea cross with chariot wheels? Thanks. I have not read much about the topics you raise, but from what I’ve read about Sinai, we’re not sure we even know which moutain is Sinai. I’ve heard people talk about finding chariot wheels in the Red Sea, but I think this is bunk. I’ve read a lot of material related to important archaeological finds and not a single one reports this as being reputable. I think the chariot wheels in the Red Sea is in the same category as all of the Noah’s Ark finds–bunk. About Sinai it is Arabia (Galatians 4:25). I have a theory that Paul went to Sinai after his conversion and spent some years reconciling the God of the Old Testament being Jesus of the New. He went to the starting point of his Jewish roots since his foundation was shaken by the revelation that Jesus was the Lord God. Thank you for posting this. I am going to quote a portion of this article in a study guide for the Book of Daniel I’m preparing. Perhaps the “8 Judean men” were Daniel and his friends who requested separate food rations? Just a thought.